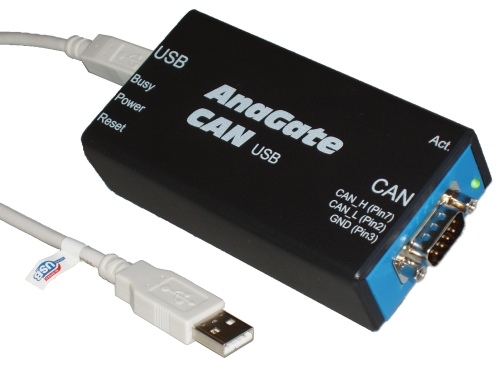 The AnaGate CAN USB gateway connects a PC to a CAN bus via the USB interface. Communication takes place via a virtual network card, which emulates networking over the USB cable. For this reason the AnaGate CAN USB is protocol compatible with all AnaGate CAN Ethernet gateways and can be easily replaced on demand. The AnaGate CAN USB basically works as a device with no own CAN identifier on the bus. The CAN identifier can be selected individually when sending telegrams. The CAN messages are transparently embedded in TCP/IP telegrams to enable communication with any CAN device on the CAN network. This means that a CAN network can be addressed over the Internet or from multiple different PCs over a network. Higher protocol layers e.g. 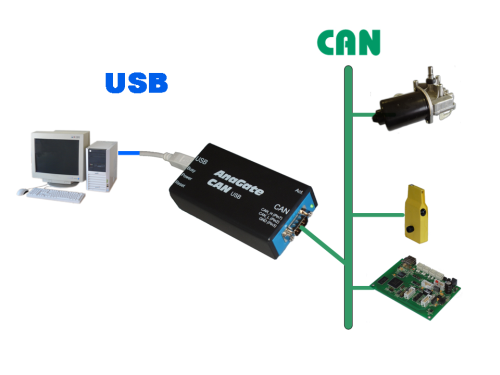 CANOpen®, Devicenet or J1939 can be used by the controller system too. WLAN communication is possible too via appropriate devices (access points). In the gateway mode the CAN messages are transferred transparently over TCP/IP between the CAN network and the controller platform (e.g. PC) in both directions. In the listen mode CAN messages can be recorded without influencing the CAN bus. The AnaGate CAN USB with its 32 bit ARM9 processor is very powerful and can be even used in high-performance systems. The performance is almost identical to the pure CAN-Ethernet gateway models, which have only the advantage of faster data rates on the physical cable connection. As Embedded PC with Linux platform the AnaGate CAN USB permits also the flexible extensions by downloading and running of application programs.